Hi there, hope you had a beautiful Easter celebration. Today I have a spring card to share with you with a pretty butterfly. To start out this card I cut an A2 size card base out of white card stock. Next I die cut the front of it using Card Cover Maker #1 and colored it in with green/blue/brown inks. I added a yellow piece of card stock underneath to show the design of the die cut. 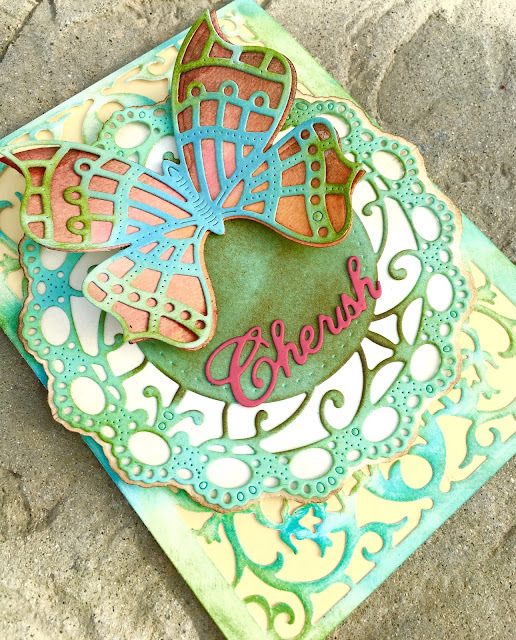 Next I die cut an Ankara Lace Doily with Angel Wing out of light blue card stock and added some green and brown ink. I also die cut the wing that comes with the same die out of cream card stock and glued it to the lace die and using pop dots I adhered it to the card front. Next I die cut the angel wing from the Whimsical Butterfly with Angel Wing die set and sprayed it with shimmer ink and than die cut the actual butterfly from the same set and glued it together and adhered it to the doily. 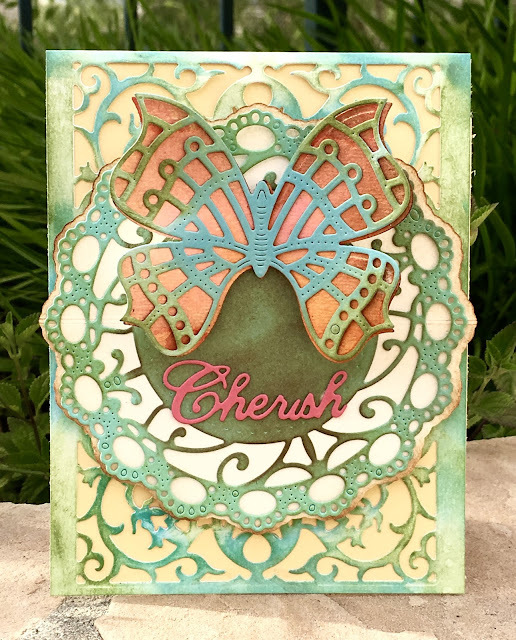 Finally I die cut the sentiment Cherish out of pink card stock and added it below my butterfly. Thanks for stopping by and hope to see your creations in our newest challenge.